2 What Is the Difference Between a Sport Coat & a Suit Coat? Men’s fashion dictates wearing suits for social or professional occasions such as weddings, formal parties, dinners and business meetings. Suits come in many styles and materials that are paired with a range of complementary accessories including shirts, ties, cuff links and cummerbunds, generally falling into the category of wedding or business suits. 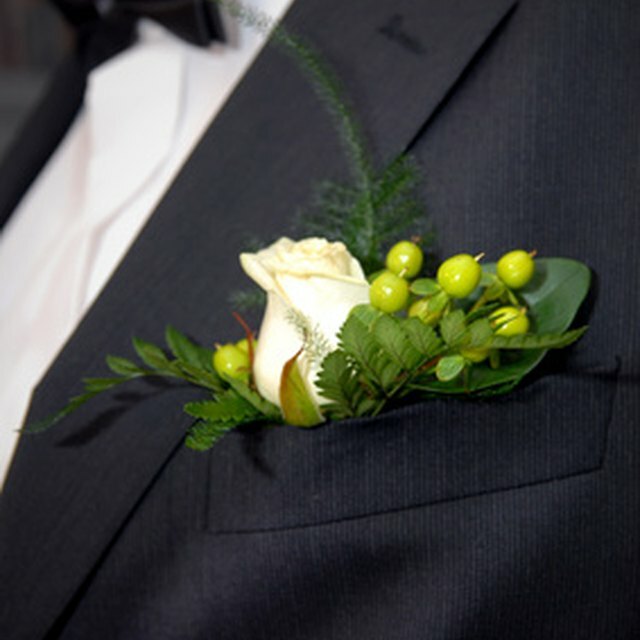 Although wedding suits can be any fabric or color, the most common wedding suits are black or dark gray with single-breasted jackets. Materials range from silk to wool, depending on the season. They are typically worn with white shirts with French cuffs fastened with understated gold or silver cuff links. A vest in a matching or coordinating color adds a traditional flair to a wedding suit. Wedding suit slacks have flat or pleated fronts. Technically a wedding suit, tuxedos are more formal matrimonial attire. They are traditionally black or white but come in a wide range of colors and patterns as well as in contemporary or classic styles. Tuxedo pants can be flat or pleated and may be adorned with a strip of satin down the outer pant leg. Shirts worn with tuxedos often have pleats or other decorative trim on the front, as well as French cuffs, and are white or pastel colors. A cummerbund, a classic tuxedo accessory, is frequently worn around the waist and made from fabric that matches or complements a solid color silk tie or decorative jacket pocket square. This style of business suit is similar to a wedding suit but is normally available in more colors, materials and styles. Color choices generally include black and shades of brown, blue, green and gray. The fabrics for formal business suits include wool, silk and natural or synthetic blends and include pinstripe designs and natty textures such as tweed. The shirts worn with formal business suits range from pastel to dark colors and have French cuffs. Ties and pocket squares worn with formal business suits are usually patterned rather than solid. General business suits are often not suits per se but tailored sports coats paired with trousers in a similar or complementary color. Shirts worn with general business suits have buttoned cuffs and tie designs are more colorful and patterned than those paired with formal suits. Casual business suits are comprised of knit or khaki pants paired with collared sport shirts worn without ties, sweaters and casual sport coats.